"The same ingredients as the revolutionary Vitalzym Liquid Gel Cap, but with double the potency." 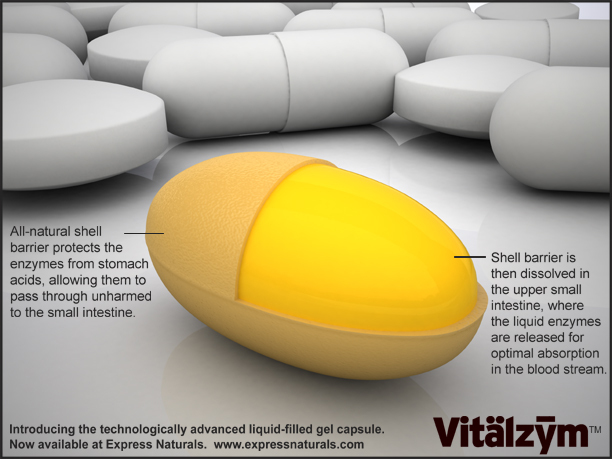 VitalzymXe Liquid-Filled Gel Capsules are protected by a technologically advanced enteric coated capsule that is used by today's most advanced pharmaceuticals. 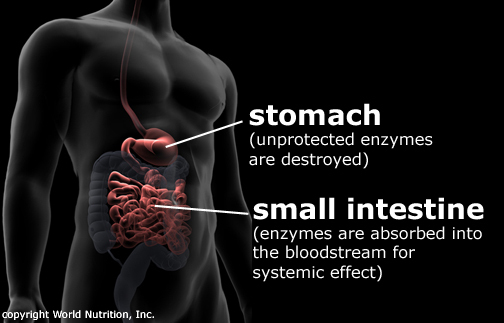 The all natural, non-toxic coating allows the enzymes to bypass the stomach acids so that they are 100% available in the small intestine. This delivery system is revolutionary to systemic enzyme blends, in that there is no loss of enzyme due to digestion or stomach acidity. Most users will experience at least three to four times the enzyme potency of the original Vitalzym, whereas some users may experience an exponentially greater effect. The difference is dependent upon each user's pH levels and dosaging habits. If you are currently taking the original Vitalzym, World Nutrition recommends first trying to reduce your dosage by 75% with VitalzymXe. If you are currently taking Vitalzym Liquid Gel Capsules, you would cut your dosage in half with VitalzymXe. VitalzymXe is regulated by the Pharmaceutical and Food Safety Bureau under the Ministry of Health, Labor, and Welfare in Japan. This agency is the Japanese equivalent of the FDA of the United States Department of Health and Human Services. Since Vitalzym is regulated in Japan, it must adhere to manufacturing requirements that are far more stringent than dietary supplements manufactured in the United States. Supplements manufactured in the United States are considered food grade, and thus, are not regulated as stringently as in Japan.